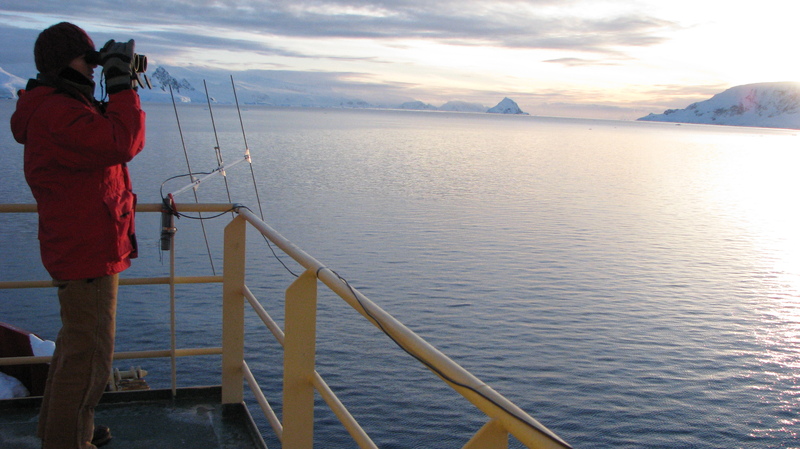 Looking for humpback whales in Antarctica. I’m a marine ecologist studying at the University of California, Santa Barbara’s Bren School of Environmental Science & Management. In general, my work is focused on large marine vertebrates (turtles, marine mammals, fish, birds): where they are, what they eat, and how they move when they are far offshore in the open ocean. We can better manage endangered species if we understand these things about their ecology, especially in places where they compete with humans for use of resources, like in productive fishing areas. For my PhD research, and the main focus of this blog, I am concentrating specifically on olive ridley sea turtles in the eastern tropical Pacific, and am advised by Dr. Steve Gaines, Dr. Jeff Seminoff, Dr. Bruce Kendall, and Dr. Dave Siegel. I work with many other biologists, wildlife managers, and non-profit organizations, as well (see cool projects & links page for details). I earned my BS at the University of Miami in 2002 (C-A-N-E-S – Canes! ), and my MEM at Duke University in 2010 (Let’s Go Duke!). My career has taken me to some amazing places including Antarctica, Mexico, Midway Atoll, Costa Rica, Australia, and the Channel Islands. When I’m not chasing wildlife, I like to travel, play basketball, hike, paddleboard, camp, and go to the beach with my dog.